Stunned silence from the managers. “What about us?” one of them finally says. “Still being decided,” the CEO replies, turning to some papers on his desk to signal the meeting is over. As the team files out, the CEO thinks to himself, Whew, it’s a relief to have that behind me. I’m sure the team appreciated that I was honest with them . But as the managers return to their offices, they have an entirely different takeaway from the conversation. For businesses in crisis, whether in a restructuring or taking steps to avoid one, the stakes cannot get any higher. In these situations, messages matter – not only their content but also their structure, the channel, the timing, and the tone they’re delivered in. What, when and how executives communicate during a crisis is critical and can have a dramatic effect on the change process and resulting outcomes. That’s why we’ve developed a set of principles that business leaders can follow to communicate more effectively – and empathetically – during a crisis. When a company is in deep trouble, the amount of time and attention it gives to its communications can unintentionally get minimized. An executive might assume that bad news is bad news and there’s no way to soften the blow. Such an approach can undermine an otherwise constructive resolution of the circumstance. If leaders fail to communicate with empathy, a number of repercussions are likely. Heavy-handed, poorly planned communications can quickly erode a company’s culture, which may then take years to repair. On a personal level, careless or incomplete communication can undermine leaders’ reputations and credibility, and make it much harder to motivate and reengage the workforce after the crisis gets resolved. Many academic models have been developed for the management of change, but few deal with how leaders should communicate. Four principles, summarized with the CARE acronym, provide a foundation for effective communication in a crisis. Chart a course: Map out the key events through the crisis. Where will stakeholders have questions? Where will the company need specific stakeholders to act or respond in a particular way to achieve a desired outcome? For each event, leaders will have to preemptively communicate clear and appropriate messages ahead of the event and then repeat those messages consistently during and after the event. In these situations, the more communication, the better. Regular meetings can also help – for example, by way of a monthly town hall meeting at which the CEO updates employees on the current state of progress against established goals, with local leaders providing more-interpersonal messaging and support. Address the issues: Rather than avoiding or minimizing difficult topics and potential consequences, leaders should tackle the issues directly. Staff are usually more aware of underlying problems than management would like to believe, and downplaying issues can be counterproductive. It makes employees feel that the leaders aren’t honest, don’t trust the staff to handle sensitive news, don’t value staff input or contribution to the change effort, or are simply out of touch with reality. Respect stakeholder needs : Each constituency has unique concerns and needs during a crisis. For example, employees may worry about job security or anticipated cuts to salaries or benefits. In extreme cases, they may wonder whether they’re going to receive their next paycheck. External stakeholders, like vendors, may be anxious about getting paid and their rights if or when the company files for bankruptcy. Customers may need reassurance that supply will not be disrupted. Government agencies, tax authorities, shareholders and bondholders all have their own unique concerns as well. Good communication is a way to demonstrate both respect and reassurance to all stakeholders. Empathize: Leaders should be human and remain calm, professional, and direct. All communications should be non-personal and respectful, which requires a combination of courage, candor and compassion. Messages that connect leadership with the audience, that understand personal situations, and that address worries create the right environment for change and transition. The psychology of the CARE principles is well established . Communication is not a one-way process. It must incorporate the audience’s perspective, needs and voice to help shape the overall message and its meaning. Leaders must serve as the guiding voice through the storm, articulate the current situation directly and without panic or alarm, and rally employees and teams so as to gain commitment and alignment for accomplishing the important tasks ahead. 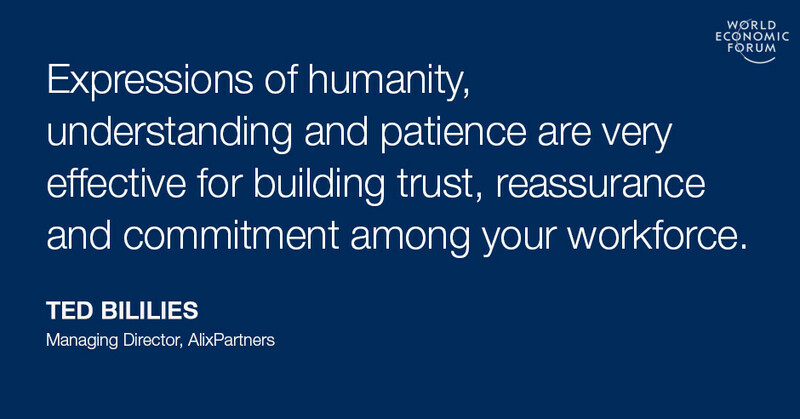 Expressions of humanity, understanding and patience are very effective communication tools for building trust, reassurance and commitment among the workforce. Applying the CARE principles requires commitment and a structured process. A core group of operational leaders and communications experts need to build a timeline that clarifies what the team members know and what they don’t know. The group will also identify key events in the restructuring process that require explanation, especially if the events will require employees to react in specific ways. For each key event, the leadership and the communication teams will determine the specific message or messages, set the storyline for each set of stakeholders and decide how to deliver the right message to the right group at the right time – whether it’s in a letter, at a meeting, or through a formal or social media channel. The team will also have to designate who will deliver specific messages, specify aspects those designees should and should not emphasize, and anticipate how to field questions. Last, if management historically has not been good at communicating, the team might want to start by educating company leaders about the value of good communications and how to keep messages based in reality and focused on the future. The bottom line? The way executives communicate during a crisis can have a major impact on how employees engage and how the company performs both during the crisis and afterward. It takes time to craft and deliver clear, consistent communications and make people feel heard and valued during what is invariably a stressful period for the company. But the rewards justify thoughtful efforts. Moreover, communicating empathetically is simply the right way to treat people.